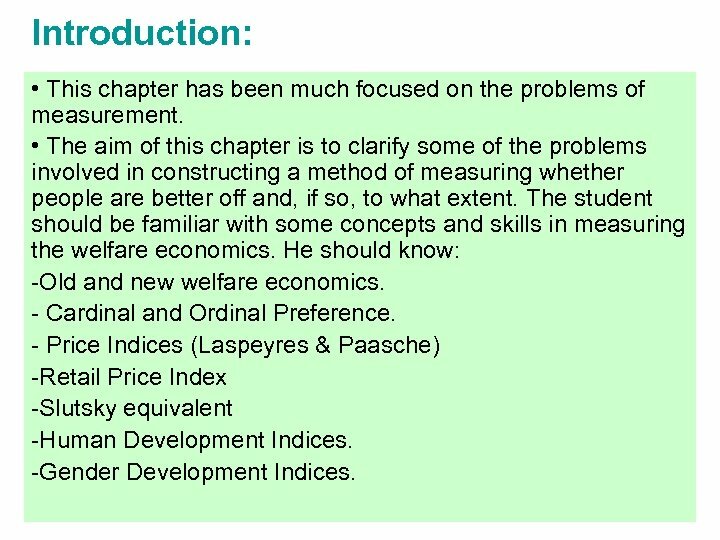 Introduction: • This chapter has been much focused on the problems of measurement. • The aim of this chapter is to clarify some of the problems involved in constructing a method of measuring whether people are better off and, if so, to what extent. 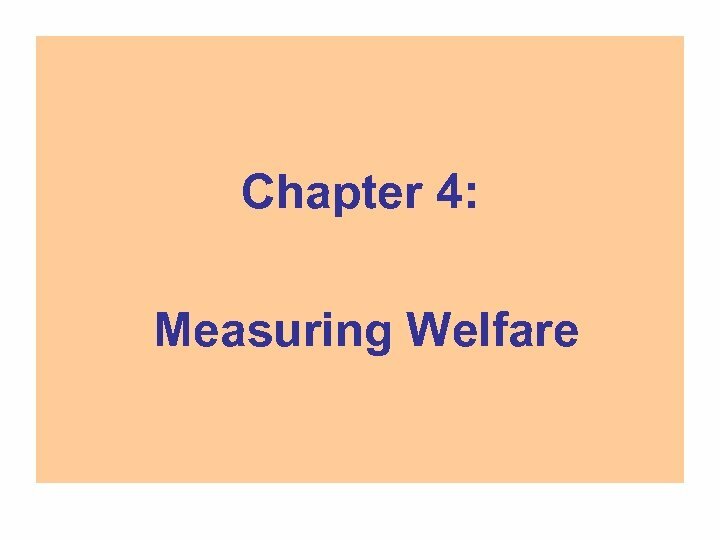 The student should be familiar with some concepts and skills in measuring the welfare economics. He should know: -Old and new welfare economics. - Cardinal and Ordinal Preference. - Price Indices (Laspeyres & Paasche) -Retail Price Index -Slutsky equivalent -Human Development Indices. -Gender Development Indices. 2. Utility in the development of welfare economics: Old and new welfare economics. - Welfare Economics: studies people’s well-being in different - economic situations. 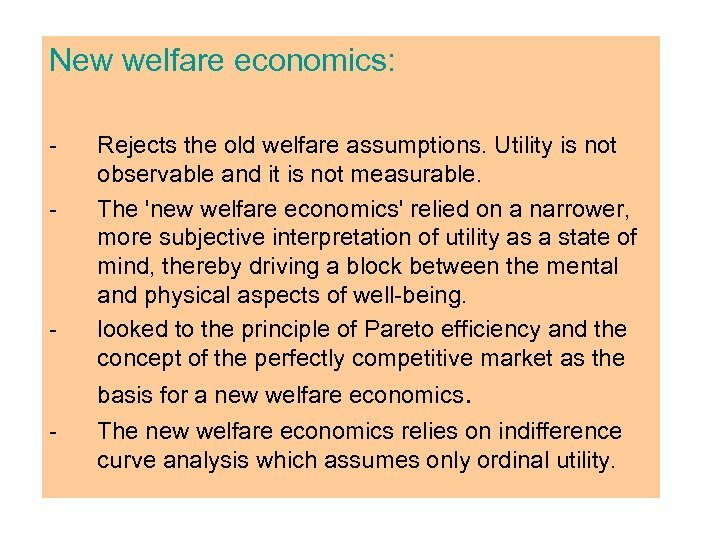 There are two interpretations of utility: Old and New welfare economics: The 'old welfare economics' assumed that the concept of utility had a wide range of application, covering both mental and physical aspects of well-being. 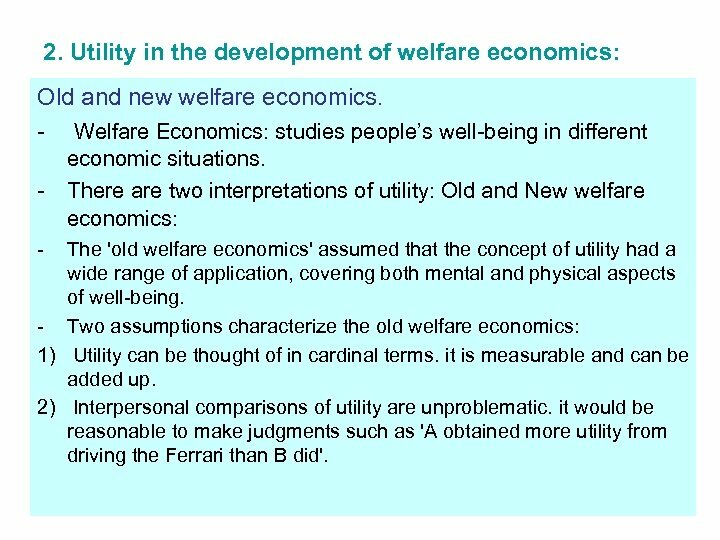 - Two assumptions characterize the old welfare economics: 1) Utility can be thought of in cardinal terms. it is measurable and can be added up. 2) Interpersonal comparisons of utility are unproblematic. it would be reasonable to make judgments such as 'A obtained more utility from driving the Ferrari than B did'. New welfare economics: - - Rejects the old welfare assumptions. Utility is not observable and it is not measurable. The 'new welfare economics' relied on a narrower, more subjective interpretation of utility as a state of mind, thereby driving a block between the mental and physical aspects of well-being. looked to the principle of Pareto efficiency and the concept of the perfectly competitive market as the basis for a new welfare economics. - The new welfare economics relies on indifference curve analysis which assumes only ordinal utility. 2. 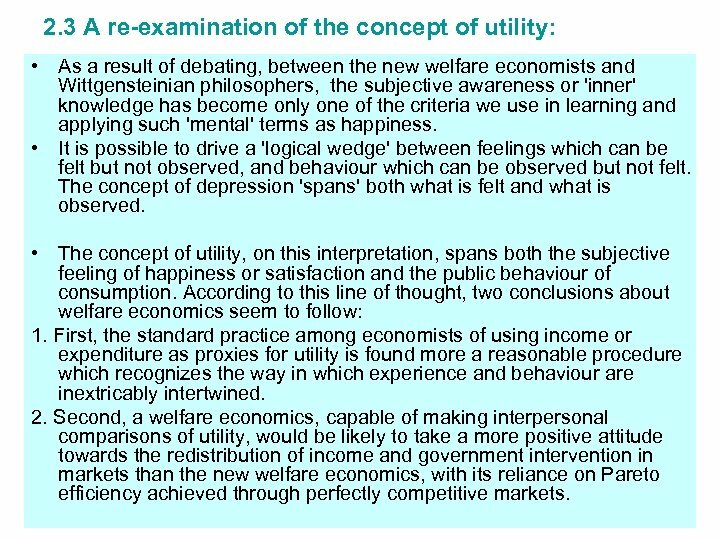 3 A re-examination of the concept of utility: • As a result of debating, between the new welfare economists and Wittgensteinian philosophers, the subjective awareness or 'inner' knowledge has become only one of the criteria we use in learning and applying such 'mental' terms as happiness. • It is possible to drive a 'logical wedge' between feelings which can be felt but not observed, and behaviour which can be observed but not felt. The concept of depression 'spans' both what is felt and what is observed. • The concept of utility, on this interpretation, spans both the subjective feeling of happiness or satisfaction and the public behaviour of consumption. According to this line of thought, two conclusions about welfare economics seem to follow: 1. First, the standard practice among economists of using income or expenditure as proxies for utility is found more a reasonable procedure which recognizes the way in which experience and behaviour are inextricably intertwined. 2. Second, a welfare economics, capable of making interpersonal comparisons of utility, would be likely to take a more positive attitude towards the redistribution of income and government intervention in markets than the new welfare economics, with its reliance on Pareto efficiency achieved through perfectly competitive markets. • • After the fall in the price of G, the household moves to a new equilibrium position at point B. Being able to buy more of both F and G, the household is clearly better off. The question is, how much better off? 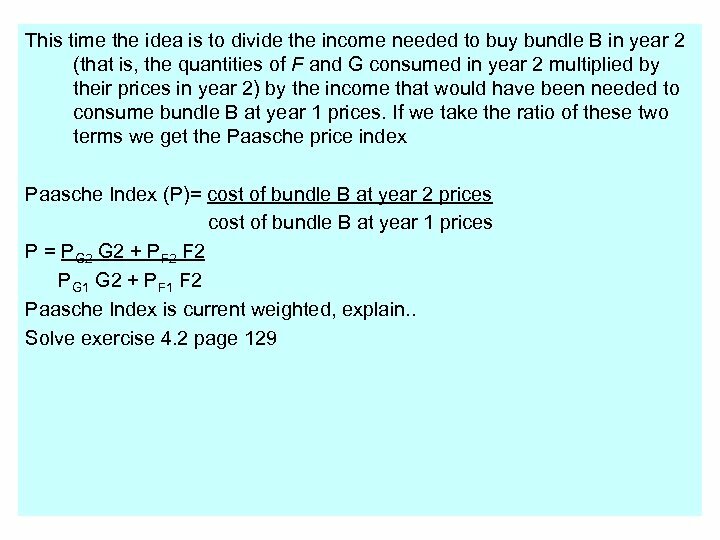 In order to answer that question, we need a way of comparing the value of the bundle of goods purchased in year 1 with that purchased in year 2, represented by points A and B respectively on Figure 4. 1. It is the income effect that measures how much better off the household is as a result of the price change. 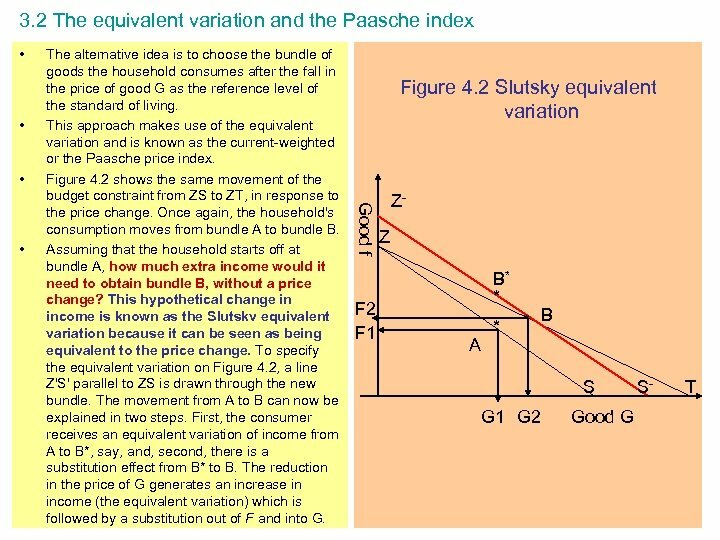 Substitution and income effects are, respectively, movements along and movements between indifference curves, but because we do not know where the indifference curves are, we need to work with a Slutsky approximation to the income effect. We can see this by drawing a new budget constraint ML parallel to ZT but passing through point A. 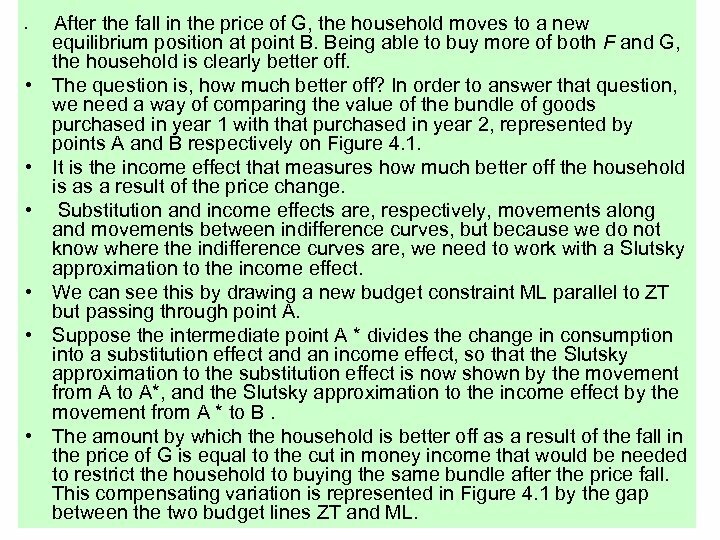 Suppose the intermediate point A * divides the change in consumption into a substitution effect and an income effect, so that the Slutsky approximation to the substitution effect is now shown by the movement from A to A*, and the Slutsky approximation to the income effect by the movement from A * to B. The amount by which the household is better off as a result of the fall in the price of G is equal to the cut in money income that would be needed to restrict the household to buying the same bundle after the price fall. This compensating variation is represented in Figure 4. 1 by the gap between the two budget lines ZT and ML. 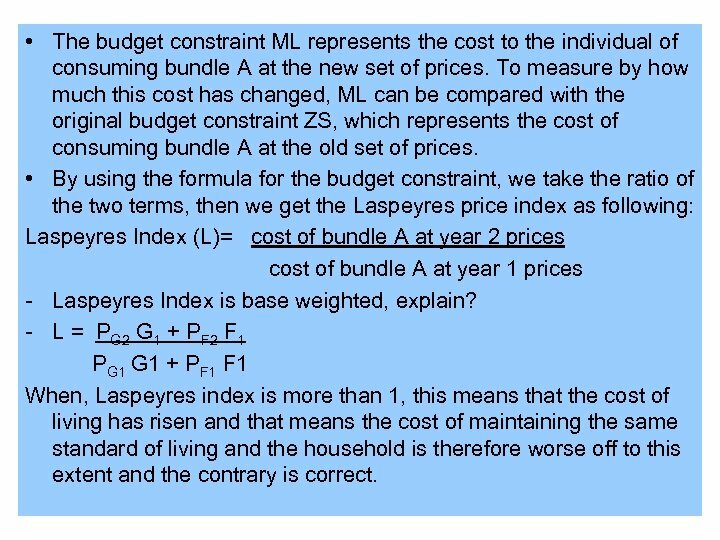 • The budget constraint ML represents the cost to the individual of consuming bundle A at the new set of prices. To measure by how much this cost has changed, ML can be compared with the original budget constraint ZS, which represents the cost of consuming bundle A at the old set of prices. 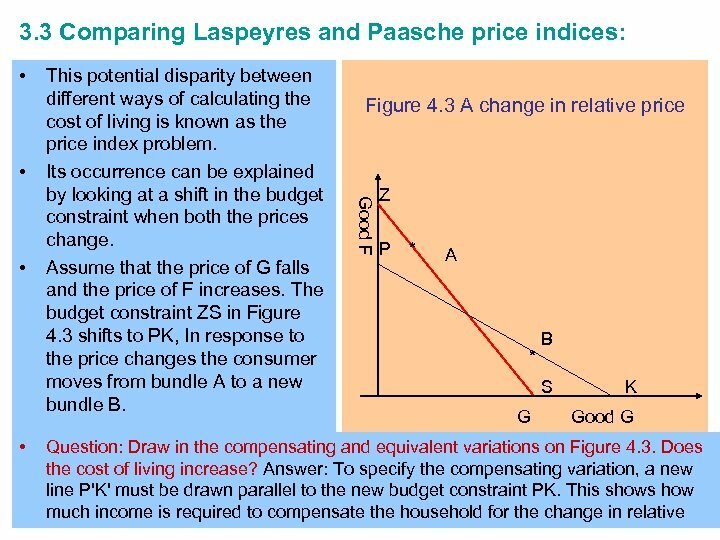 • By using the formula for the budget constraint, we take the ratio of the two terms, then we get the Laspeyres price index as following: Laspeyres Index (L)= cost of bundle A at year 2 prices cost of bundle A at year 1 prices - Laspeyres Index is base weighted, explain? 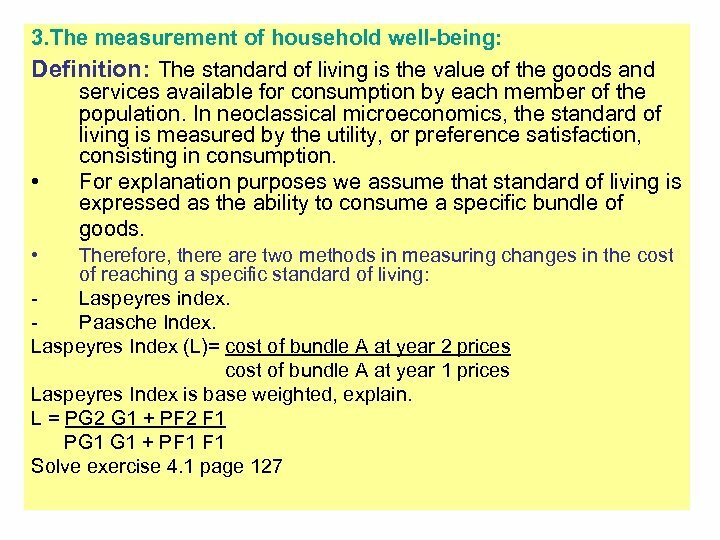 - L = PG 2 G 1 + PF 2 F 1 PG 1 + PF 1 When, Laspeyres index is more than 1, this means that the cost of living has risen and that means the cost of maintaining the same standard of living and the household is therefore worse off to this extent and the contrary is correct. 3. 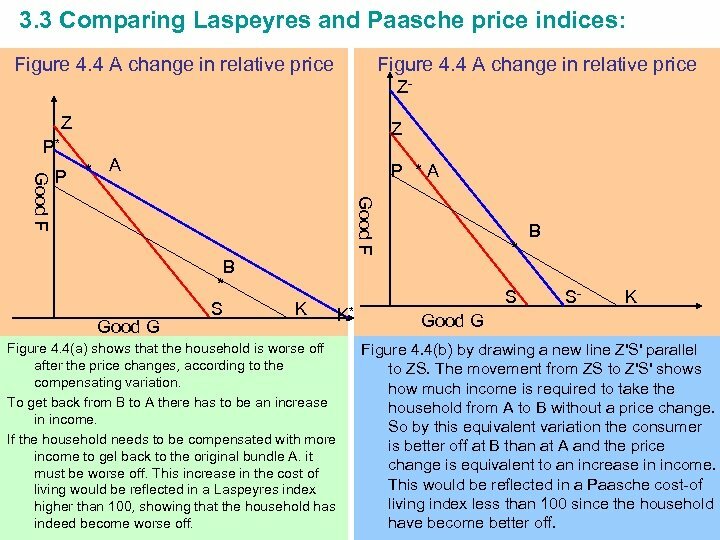 3 Comparing Laspeyres and Paasche price indices: Figure 4. 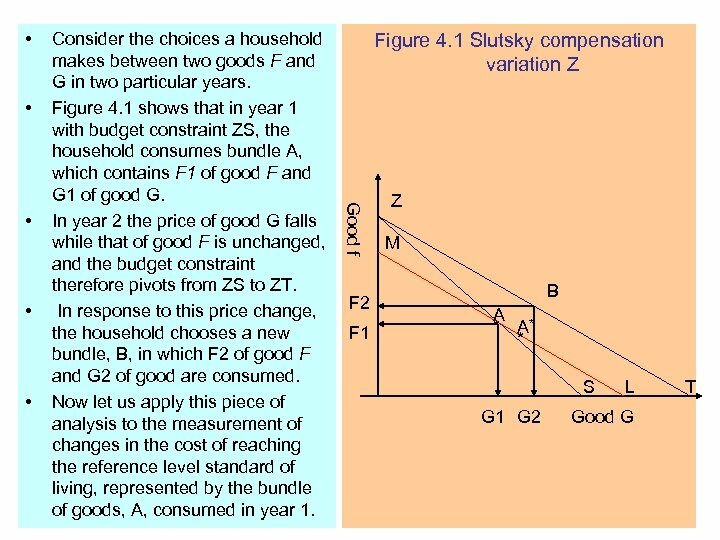 4 A change in relative price Z- Z P* * A P *A Good F P Z Good G B * S K Figure 4. 4(a) shows that the household is worse off after the price changes, according to the compensating variation. To get back from B to A there has to be an increase in income. If the household needs to be compensated with more income to gel back to the original bundle A. it must be worse off. This increase in the cost of living would be reflected in a Laspeyres index higher than 100, showing that the household has indeed become worse off. K* * S B S- K Good G Figure 4. 4(b) by drawing a new line Z'S' parallel to ZS. The movement from ZS to Z'S' shows how much income is required to take the household from A to B without a price change. So by this equivalent variation the consumer is better off at B than at A and the price change is equivalent to an increase in income. This would be reflected in a Paasche cost-of living index less than 100 since the household have become better off. 5. 2 Capabilities and functionings: The United Nations (DP) has been using the “capabilities approach” as a framework for the measurement of the well being and agency of people all over the world. The applications of this approach are: 1. The Human Development Index (HDI) is a systematic attempt to measure what the people of a particular country are able to do and to be, it offers an account of agency as well as being. 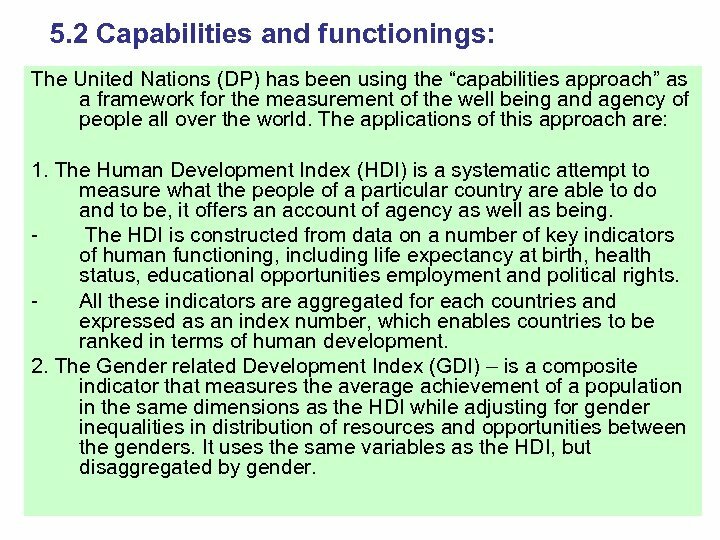 The HDI is constructed from data on a number of key indicators of human functioning, including life expectancy at birth, health status, educational opportunities employment and political rights. All these indicators are aggregated for each countries and expressed as an index number, which enables countries to be ranked in terms of human development. 2. The Gender related Development Index (GDI) – is a composite indicator that measures the average achievement of a population in the same dimensions as the HDI while adjusting for gender inequalities in distribution of resources and opportunities between the genders. It uses the same variables as the HDI, but disaggregated by gender.